Talk about bargains. 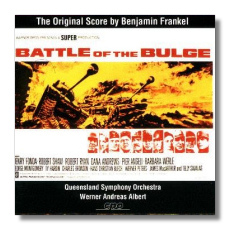 This score by the rather obscure but talented British composer Benjamin Frankel (1906-73) contains all the music to the 1965 film, The Battle of the Bulge, a less than masterful cinematic effort, but a compelling film nevertheless. I saw it on its first run as a college student and became enamored of the score. I went back to see it a second time, as I recall, finding the music and the presence of Robert Shaw worth the price of admission (probably then about a dollar-and-a-quarter, by the way). Forget the performances of Henry Fonda and Charles Bronson, it was the acting and charismatic screen persona of Robert Shaw that helped make this film. There are a few issues here involving the score that must be addressed. Track six begins with a brief orchestral introduction, followed by the chorus singing the so-called "Panzerlied". In the film, however, I distinctly recall that the song was sung at the outset by a single German soldier, with no introduction or accompaniment. He was soon joined by his comrades to make it a choral number, and then Hessler and his aid chimed in on the second go-round. Here, however, there is an orchestral introduction, followed by the full chorus delivering the theme four times, not twice. I suppose this is a minor point, but one I thought worth mentioning. Frankel, by the way, treats this theme here as a bombastic, rather cheap-sounding propaganda song, which it was. The opening cue, Prélude, is probably the most powerful music in the score. How deliciously sinister the music is here. It turns out that Frankel, a Jew, did not want to use the "Panzerlied" theme in the opening or anywhere else in the score. Who could blame him? Ultimately, however, he agreed to use it. In the opening cue, he employs it in just about the most inventive way imaginable: a tuba plays the theme, sounding both sinister and comical. Hitler and the Nazis would have hated this rendition. Frankel's orchestration throughout this section is remarkably effective, especially in the percussive effects, with tambourine and squeaking reeds producing rhythmic support to enhance the sinister tuba theme from the Panzerlied. I never did much admire the theme of the Allies, stiff and a bit pompous in sound as it was. But here, Albert delivers it with commitment and makes it more palatable to the ear than in the original score. In fact, he conducts all eighteen cues with total commitment. The penultimate item, "The attack on the fuel depot and Hessler is killed" is completely convincing. It is especially powerful when the chorus begins singing that cheap "Panzerlied", while Hessler struggles to overtake the fuel depot. This was the climactic moment in the film. Here, it is also the moment of greatest drama in the music. In sum, this is a brilliant score by a composer who deserves greater recognition. This was his last effort of more than one hundred in the genre. The performance by the Queensland Symphony Orchestra is excellent and the notes are informative. Sound is superb. If you're a film score buff or someone interested in good 20th-century music, this CD issue won't disappoint.